The main aim of this paper is to provide some probabilistic notions on causality proposed to be applied to the nomic statements which intend to give account of the indeterministic processes within the domain of a scientific theory. In general, such statements are, in more or less extent, idealized statements which rest on a variety of unrealistic suppositions. I try to show how the probability distribution over the final states of an indeterministic process changes accordingly as the nomic statement in question is de-idealized by means of addition of the causally relevant factors. In order to illustrate the study I take few nomic statements from population genetics. Besides, in the course, I attempt to contrast the ideas embraced here with some of the notions of Humphreys´ ontic conceptions of causality and explanation, which are contrary to the epistemic view adopted here about those subjects. Avers, Ch. J. (1989). Process and Pattern in Evolution, New York, Oxford University Press. Ayala, F. J. (2012). The Big Questions: Evolution, Quercus Publishing Plc. Davis, W. A. (1988). “Probabilistic Theories of Causation”, in J. H. Fetzer (ed. ), Probability and Causality, North Holland, D. Reidel, pp. 133-160. Eldredge, N. (1999). The Pattern of Evolution, New York, W. H. Freeman and Company. Eells, E. (1988). “Probabilistic Causal Interactions and Disjunctive Causal Factors”, in J. H. Fetzer (ed. ), Probability and Causality, North Holland, D. Reidel, pp. 189-209. Eells, E. & E. Sober (1983). “Probabilistic Causality and the Question of Transitivity”, Philosophy of Science 50, pp. 35-57. Gould, S. J. (2002). The Structure of Evolutionary Theory, Harvard, Mass., Harvard University Press. Hardy, G. H. (1908). “Mendelian proportions in a mixed population”, Science, July 10, pp. 49-50. Humphreys, P. (1989). The Chances of Explanation, New Jersey, Princeton University Press. Griffths, A. J. , W. M. Gelbart, J. H. Miller and R. C. Lewontin(1999). Modern Genetics Analysis, New York, H. Freeman and Company. Mayr, E. (1991). One Long Argument: Charles Darwin and the Genesis of Modern Evolutionary Theory, Harvard, Mass., Harvard University Press. McMullin, E. (1985). “Galilean Idealization”, Studies in the History and Philosophy of Science, Vol. 16, No. 3, pp. 247-273. Nowak, L. (1992). “The Idealizational Approach to Science: A Survey” en J. Brzezinski and L. Nowak (eds. ), Idealization, Approximation and Truth, Amsterdam/Atlanta, Poznan Studies in the Philosophy of Sciences and Humanities, Vol. 25, pp. 9-63. Rosen, D. H. (1982-83). 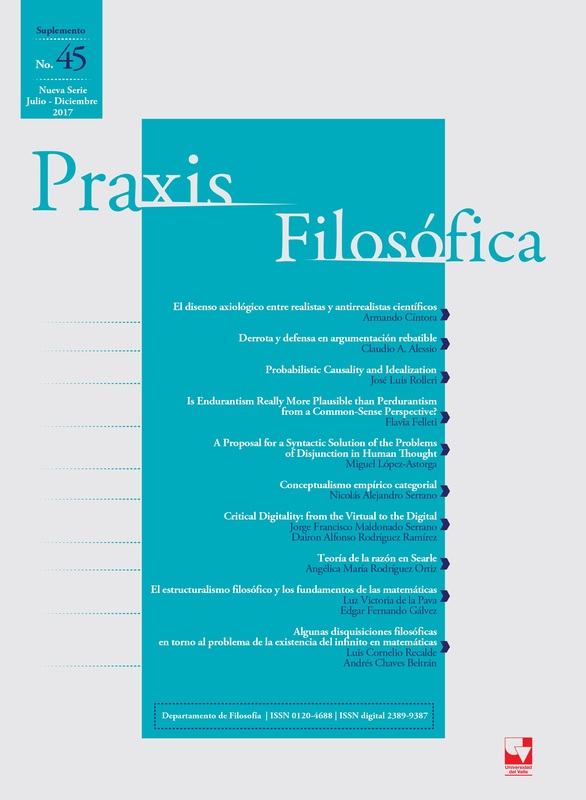 “A Critique to Deterministic Causality”, Philosophical Forum, Vol. XIV, No. 2, pp. 101-130. Salmon, W. C. (1980). “Probabilistic Causality”, Pacific Philosophical Quarterly, Vol. 61, Nos. 1-2, pp. 50-74. Reprinted in Salmon (1998), pp. 208-232. Salmon, W. C. (1984). Scientific Explanation and the Causal Structure of the World, Princeton, Princeton University Press. Salmon, W. C. (1998). Causality and Explanation, New York/Oxford, Oxford University Press. Sober, E. (2000), Philosophy of Biology, Colorado/Oxford, Westview Press. Suppes P. (1970). A Probabilistic Theory of Causality, Amsterdam, North-Holland Publishing Company. Suppes, P. (1984). Probabilistic Metaphysics, New York, Basic Blackwell.